Flipping through the latest issue of The Manhattan Projects reveals the following images: J. Robert Oppenheimer’s psychotic twin brother Joseph shooting an alien sentry in the head and feasting on its brain to absorb it into his multiple personalities; a group of mad scientists attacking an alien army by travelling through Albrecht Einstein’s interplanetary gateway; and the irradiated skull of physicist Harry Daghlian liquefying an entire species. Jonathan Hickman and Nick Pitarra’s series is gory, clever, infinitely imaginative revisionist history, combining the best of Jack Kirby and Warren Ellis, with a dash of Tarantino-esque violence that’s simultaneously humorous and horrific. It’s the best new series of the year, and each issue exposes a shocking new wrinkle in Hickman’s expansive story while spotlighting stunning artwork from Pitarra, who grows dramatically with each new chapter. Last issue’s Einstein spotlight completed the initial setup of the book’s main cast, revealing that the Einstein in this series is actually an insane (of course) alternate-reality version who killed the real Einstein when he travelled through the aforementioned gateway. The Manhattan Projects #5 is the first time Hickman gathers his entire cast of scientists together against a common threat—an alien invasion—and it’s an exhilarating exploration of fringe sci-fi ideas and the deeper philosophical issues that arise with scientific expansion. “Exhilarating” isn’t the usual word associated with science and philosophy, but the magic of this series is the way the creators take these huge ideas and present them in an accessible, deeply entertaining way. The Manhattan Projects is Hickman’s first creator-owned ongoing series, and the lessons he’s learned from plotting long-term superhero runs like Fantastic Four and Secret Warriors have resulted in one of the most dynamic independent comics currently being published. The stakes have to stay consistently high in superhero comics to justify why the characters are always hitting each other, and for the most part, any single issue on the stands will have at least one fight scene and a cliffhanger intended to build momentum toward the next fight scene. The best superhero comics writers make the reader care about the people throwing punches, and Hickman has proven himself one of the A-list, particularly with the family dynamic he’s brought to Fantastic Four. 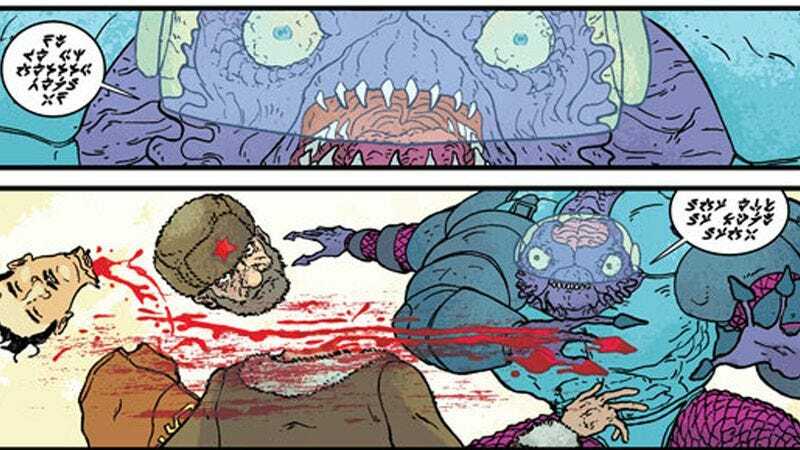 The ability to balance human emotion with extraordinary spectacle is Hickman’s greatest strength, and nowhere is that better exemplified than in The Manhattan Projects. Each issue of this series features at least one flashback to a major event in one of the characters’ lives, and #5 spotlights a telling moment in physicist Richard Feynman’s relationship with his overbearing father: After a less-than-impressive day at school, a young Feynman is told by his father, “Anything good in this world is forged by discipline and correction,” and then given the choice between the belt or the stick for his beating. Like Lost, there are a lot of heady scientific and philosophical elements discussed in this series, but at its core, The Manhattan Projects is a book about good and evil. Guess which one America is? The words of Feynman’s father reverberate through the entire issue as Hickman illustrates the lack of discipline and correction among his core group of scientists. These are not good people, but the only person that is truly aware of his malevolent role in the universe is Joseph Oppenheimer, and his self-awareness is distributed across multiple murderous personalities. Oppenheimer’s alternate personalities are all highlighted with a stark shade of red, the color of evil in this book. The flashbacks are all colored blue and red, with the former representing objects and people that are good: J. Robert Oppenheimer and the original Albert Einstein are both blue before being replaced by their red-hued doppelgangers. In this issue’s flashback, Feynman’s father, the stick, and belt are all red. The chair in his father’s office is also red, a brilliant way of showing a character’s negative emotional association with an otherwise mundane object. The conflict between red and blue comes to a head this issue, represented by the cover graphic of a disc composed of small rectangles equally split between shades of the two colors. Hickman’s covers for this book are abstract images that say nothing about the interior contents except for a small blurb detailing the book’s core concept, but the emphasis on design over content makes each cover stand out on the rack. The major idea of each issue is boiled down to one evocative image, and the red-and-blue mosaic of the #5 cover is representative of the gradations of morality exhibited by Hickman’s characters. With this high-concept fringe sci-fi series, Hickman is commenting on scientific expansion after World War II and its misuse at the hands of power-hungry, self-serving individuals. After Daghlian and Enrico Fermi kill their alien enemies, they’re confronted by the attack’s sole survivor, the hulking neon-green creature Raal, who puts the actions of the United States in context: “The first extraplanetary odyssey initiated by your world ending in the genocide of a species…not the best way to make your mark in the cosmos.” The growth of the United States’ power has consistently been achieved through death, whether it’s killing off massive numbers of Native Americans or dropping two atomic bombs on Japan. This series takes that idea to the extreme, imagining what the United States would become if the artificial-intelligence mind of FDR created a post-World War II shadow government run by a group of genius lunatics. Not only is that concept rife with dramatic potential, it’s fun as hell, and no matter how high the stakes get, Hickman still manages to incorporate humor into each script. From the alien asides at the start of the issue to the cattiness that arises when hyper-intellectuals with their own individual agendas get together, Hickman finds a way to lighten the mood so that the scenes of genocide are even more effective. It’s something that Brian K. Vaughan’s Saga and Brandon Graham’s Prophet are also doing very well, and incorporating even the slightest bit of comedy separates these titles from the overly serious superhero titles that dominate the stands. Working with Hickman pushes Pitarra as an artist, and with each issue he’s delivering visuals that are just as creative and unpredictable as Hickman’s story. Pitarra’s layouts are made up almost entirely of widescreen panels, giving the book a cinematic quality that’s emphasized by the painstaking detail put into each character, object, and environment. His alien designs are incredibly thorough, all the way down to their skeletal systems, and the intricate linework as alien flesh bubbles and melts in a swarm of radiation is beautifully grotesque. Not only does Pitarra create accurate likenesses of the real-world figures, he brings a distinct personality to each of the characters. An artist himself, Hickman has influenced this book with his own visual sensibilities, but this issue features the series’ first signature Hickman graphic: a map of the Milky Way showing the alien threats to Earth and where they’re located in the galaxy. Enemies are marked with shades of red, while Earth is blue.